It's becoming increasingly obvious that huge numbers of Tory supporters are dangerously detached from reality, inhabiting a make believe world of ludicrous economic fairy stories and bizarre displays of fantastical thinking. The Home Secretary Amber Rudd made the latest ridiculous Tory appeal to fantastical thinking with her claim that there is no link between the huge austerity-driven Tory cuts to the UK police force since 2010 and the soaring rates of violent crime. But this kind of bizarre Tory fantastical thinking has been going on for several years. 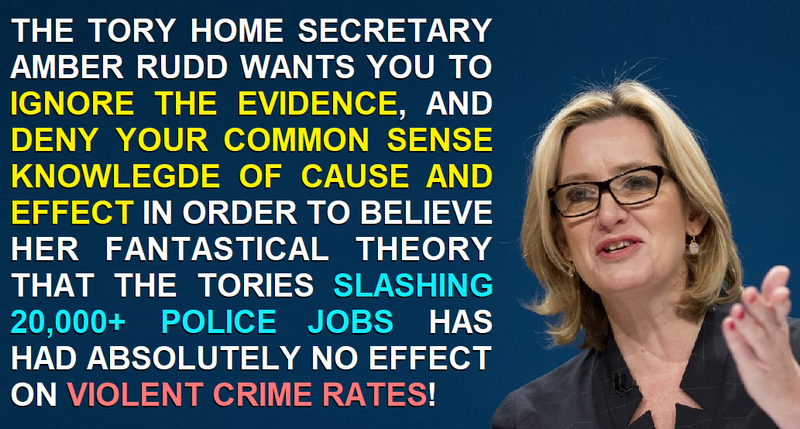 Take the typical Tory's willingness to accept all kinds of bizarre reality-reversing economic fairy stories, when the economic evidence says that they're all complete rubbish. Take the common Tory myth that the Conservatives always clear up Labour's economic messes, which is completely contradicted by the actual economic evidence, which shows that on average Labour borrow less and generate more economic growth than the Tories (despite the two largest global economic meltdowns of the last hundred years both having happened under Labour governments - the Wall Street Crash, and the 2007-08 financial sector insolvency crisis). 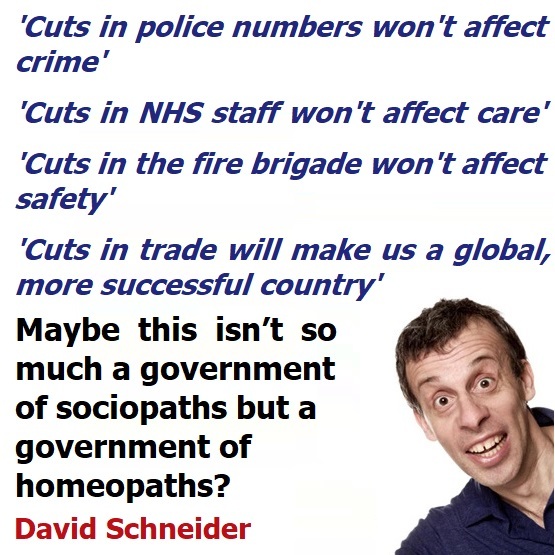 Take the way Tory supporters continually deny that austerity-driven cuts to the NHS, social care, welfare system, and the fire services have had deadly consequences. Take the Tories' bizarre insistence that quitting the single largest free trade zone on Earth (and dozens of trade deals with other nations we're signed up to via the EU) is a way of turning Britain into global trading powerhouse. Take the constant barrage of self-congratulatory Tory propaganda on their record in government since 2010. 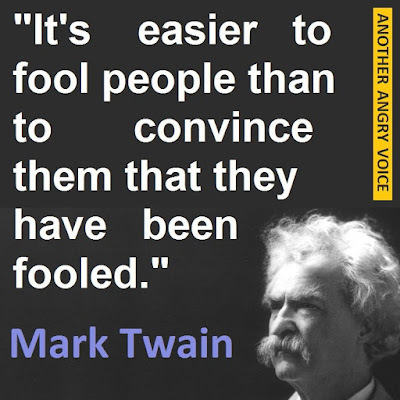 In order to believe the continual barrage of Tory claims that they've been doing a wonderful job, you'd have to ignore almost all the evidence (the longest sustained collapse in the value of workers' wages since records began, the worst productivity crisis in two Centuries, the most unaffordable housing in history, the lowest UK credit ratings scores since the credit rating system was established, the lowest growth rate in the G7, the lowest infrastructure investment in the developed world, the spectacularly missed Tory promise to eliminate the deficit by 2015 (they're now projecting 2031! ), the lowest house building rates since the 1920s, the lowest per capita policing rate since the 1970s, the 8 years of flatlining manufacturing output, the explosion in low pay low security gig economy work, the worst education cuts in decades, the lowest increase in health service spending in history, the unprecedented 67% cut in local government budget, soaring child poverty, soaring in-work poverty, the doubling of rough sleeping since 2010, and an exponential growth in food bank dependency). 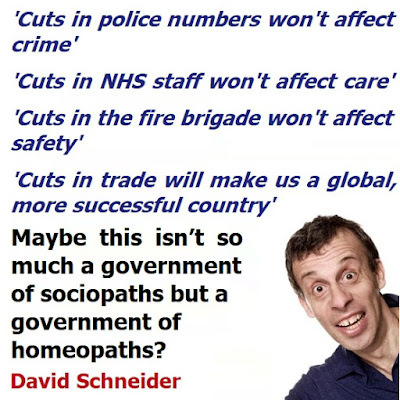 The problem of course is that Tories ignore all of this evidence (and loads more) in order to continue existing in an insulated bubble of delusion that the Tories are doing a wonderful job. It doesn't matter how much evidence you throw at them, they're simply not interested in retracting their support for this malicious and incompetent Tory government. Of course some of them actively enjoy the malice, and consider themselves to be the beneficiaries of the rotten Tory "greed is good" ideology, but most aren't actually vile and selfish vermin, they're just inhabiting a make believe world of fantastical thinking where facts and evidence, and causation are almost completely irrelevant. 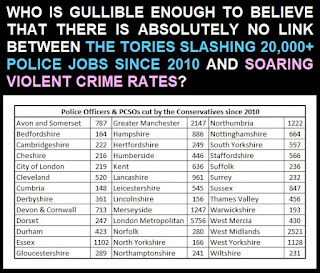 They live in a fantasy world world where rising violent crime has nothing to do with the Tories reducing the police force by 20,000 and completely gutting the police budget; where massive Tory cuts to the fire service have nothing to do with a 17% increase in fire related deaths in a single year; where huge Tory cuts to the NHS and social care have nothing to do with an estimated 120,000 excess deaths; where Tory wage repression policies and brutal cuts to in-work benefits for the working poor have nothing to do with soaring rates of in-work poverty and children in working households growing up in poverty. It's absolutely clear that millions of Tory supporters consider politics to be some kind of abstract tribalist game, rather than anything with real world consequences. These are not people who are incapable of understanding the reality that consequences have actions. These people know that in the real world if they forget to water the flowers, they die. 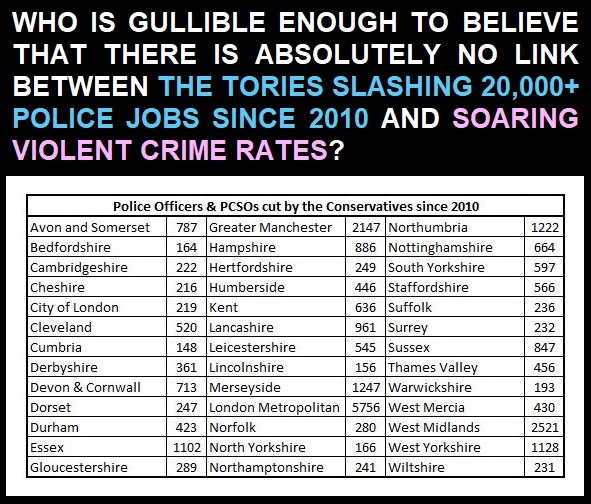 But when it comes to politics, they somehow imagine that the Tory policy of relentlessly slashing the police, fire service, NHS, social care, welfare system, workers' wages, and local government budgets actually has no adverse impact on society or the economy whatever! How we break them out of this disastrous spell of fantastical thinking is a difficult question. This type of political delusion seems to be impervious to stuff like facts, evidence, and analysis. One thought that ridicule and shame might snap them out of it, but then it's arguable that such tactics could backfire by making them even more defensive and determined to go out and vote Tory to spite the people who laughed at them. Another potential approach is to try to patiently and politely explain (with examples) that they're the victims of a political cult, and that they've been conned into believing in fantastical thinking. 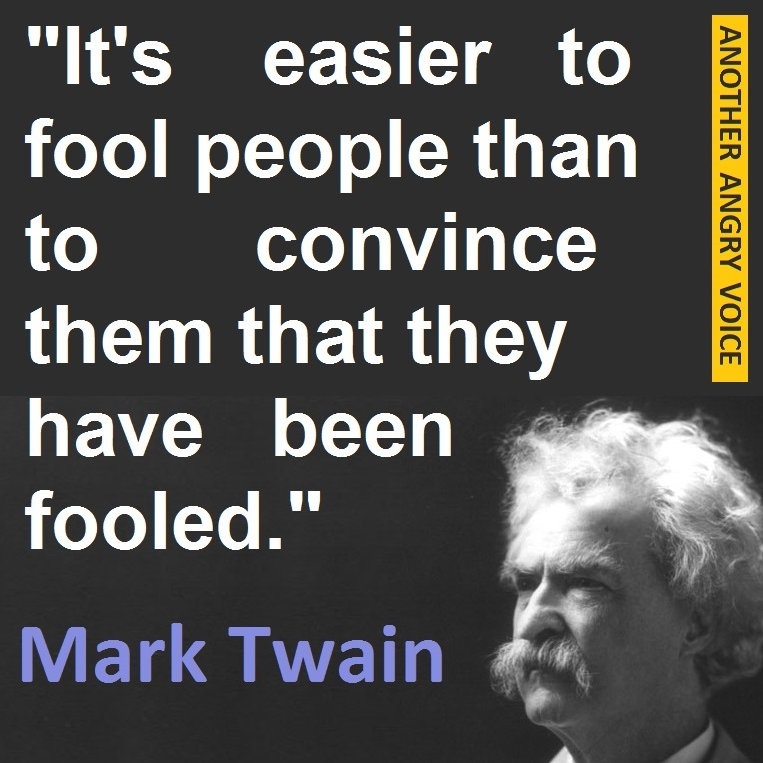 I think this is probably the best approach, but then it's still not going to be easy because as the famous smart-arse Mark Twain once said, "it's easier to fool people than convince them they've been fooled".